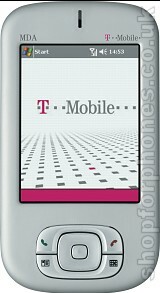 The T-Mobile MDA Compact is just as powerful as most larger PDA-style phones, just a lot smaller and lighter. With a 320x240 pixel touch sensitive display in 65,000 colours, a 640x480 pixel (VGA) resolution digital camera, Bluetooth and quad-band GSM, it's a fully featured Windows smartphone, but the T-Mobiel MDA Compact manages to do all this and still come in at just 130 grams in a 105x59x19mm form factor. The powerful Windows Mobile 2003 operating system on the MDA Compact comes with pocket versions of Outlook and Internet Explorer, plus all the tools that you'll need to keep working while on the move. Expected in November or December 2004. Subscribe to our newsletter for updates. If you want more information on the T-Mobile MDA Compact, subscribe to our mailing list. Also, the Update newsletter contains general news about new phone releases.